7 Therefore they turned their hearts to the sacrifice of the heathen in offering up their children unto these dumb idols, and hearkened not unto my voice, but endeavored to take away my life by the hand of the priest of Elkenah. The priest of Elkenah was also the priest of Pharaoh. 10 Even the thank-offering of a child did the priest of Pharaoh offer upon the altar which stood by the hill called Potiphar's Hill, at the head of the plain of Olishem. 11 Now, this priest had offered upon this altar three virgins at one time, who were the daughters of Onitah, one of the royal descent directly from the loins of Ham. These virgins were offered up because of their virtue; they would not bow down to worship gods of wood or of stone, therefore they were killed upon this altar, and it was done after the manner of the Egyptians. 20 Behold, Potiphar's Hill was in the land of Ur, of Chaldea. And the Lord broke down the altar of Elkenah, and of the gods of the land, and utterly destroyed them, and smote the priest that he died; and there was great mourning in Chaldea, and also in the court of Pharaoh; which Pharaoh signifies king by royal blood. 28 But I shall endeavor, hereafter, to delineate the chronology running back from myself to the beginning of the creation, for the records have come into my hands, which I hold unto this present time. 29 Now, after the priest of Elkenah was smitten that he died, there came a fulfilment of those things which were said unto me concerning the land of Chaldea, that there should be a famine in the land. 30 Accordingly a famine prevailed throughout all the land of Chaldea, and my father was sorely tormented because of the famine, and he repented of the evil which he had determined against me, to take away my life. 31 But the records of the fathers, even the patriarchs, concerning the right of Priesthood, the Lord my God preserved in mine own hands; therefore a knowledge of the beginning of the creation, and also of the planets, and of the stars, as they were made known unto the fathers, have I kept even unto this day, and I shall endeavor to write some of these things upon this record, for the benefit of my posterity that shall come after me. 1 Now the Lord God caused the famine to wax sore in the land of Ur, insomuch that Haran, my brother, died; but Terah, my father, yet lived in the land of Ur, of the Chaldees. 2 And it came to pass that I, Abraham, took Sarai to wife, and Nahor, my brother, took Milcah to wife, who was the daughter of Haran. 3 Now the Lord had said unto me: Abraham, get thee out of thy country, and from thy kindred, and from thy father's house, unto a land that I will show thee. 4 Therefore I left the land of Ur, of the Chaldees, to go into the land of Canaan; and I took Lot, my brother's son, and his wife, and Sarai my wife; and also my father followed after me, unto the land which we denominated Haran. 5 And the famine abated; and my father tarried in Haran and dwelt there, as there were many flocks in Haran; and my father turned again unto his idolatry, therefore he continued in Haran. 7 For I am the Lord thy God; I dwell in heaven; the earth is my footstool; I stretch my hand over the sea, and it obeys my voice; I cause the wind and the fire to be my chariot; I say to the mountainsDepart henceand behold, they are taken away by a whirlwind, in an instant, suddenly. 16 Therefore, eternity was our covering and our rock and our salvation, as we journeyed from Haran by the way of Jershon, to come to the land of Canaan. 17 Now I, Abraham, built an altar in the land of Jershon, and made an offering unto the Lord, and prayed that the famine might be turned away from my father's house, that they might not perish. 18 And then we passed from Jershon through the land unto the place of Sechem; it was situated in the plains of Moreh, and we had already come into the borders of the land of the Canaanites, and I offered sacrifice there in the plains of Moreh, and called on the Lord devoutly, because we had already come into the land of this idolatrous nation. 19 And the Lord appeared unto me in answer to my prayers, and said unto me: Unto thy seed will I give this land. 20 And I, Abraham, arose from the place of the altar which I had built unto the Lord, and removed from thence unto a mountain on the east of Bethel, and pitched my tent there, Bethel on the west, and Hai on the east; and there I built another altar unto the Lord, and called again upon the name of the Lord. 25 And it came to pass that I, Abraham, told Sarai, my wife, all that the Lord had said unto meTherefore say unto them, I pray thee, thou art my sister, that it may be well with me for thy sake, and my soul shall live because of thee. 4 And the Lord said unto me, by the Urim and Thummim, that Kolob was after the manner of the Lord, according to its times and seasons in the revolutions thereof; that one revolution was a day unto the Lord, after his manner of reckoning, it being one thousand years according to the time appointed unto that whereon thou standest. This is the reckoning of the Lord's time, according to the reckoning of Kolob. 6 And the Lord said unto me: Now, Abraham, these two facts exist, behold thine eyes see it; it is given unto thee to know the times of reckoning, and the set time, yea, the set time of the earth upon which thou standest, and the set time of the greater light which is set to rule the day, and the set time of the lesser light which is set to rule the night. 9 And thus there shall be the reckoning of the time of one planet above another, until thou come nigh unto Kolob, which Kolob is after the reckoning of the Lord's time; which Kolob is set nigh unto the throne of God, to govern all those planets which belong to the same order as that upon which thou standest. 14 And it was in the night time when the Lord spake these words unto me: I will multiply thee, and thy seed after thee, like unto these; and if thou canst count the number of sands, so shall be the number of thy seeds. 15 And the Lord said unto me: Abraham, I show these things unto thee before ye go into Egypt, that ye may declare all these words. 16 If two things exist, and there be one above the other, there shall be greater things above them; therefore Kolob is the greatest of all the Kokaubeam that thou hast seen, because it is nearest unto me. 17 Now, if there be two things, one above the other, and the moon be above the earth, then it may be that a planet or a star may exist above it; and there is nothing that the Lord thy God shall take in his heart to do but what he will do it. 18 Howbeit that he made the greater star; as, also, if there be two spirits, and one shall be more intelligent than the other, yet these two spirits, notwithstanding one is more intelligent than the other, have no beginning; they existed before, they shall have no end, they shall exist after, for they are gnolaum, or eternal. 20 The Lord thy God sent his angel to deliver thee from the hands of the priest of Elkenah. 1 And thus we will finish the heavens and the earth, and all the hosts of them. 5 According to all that which they had said concerning every plant of the field before it was in the earth, and every herb of the field before it grew; for the Gods had not caused it to rain upon the earth when they counseled to do them, and had not formed a man to till the ground. 7 And the Gods formed man from the dust of the ground, and took his spirit (that is, the man's spirit), and put it into him; and breathed into his nostrils the breath of life, and man became a living soul. 13 But of the tree of knowledge of good and evil, thou shalt not eat of it; for in the time that thou eatest thereof, thou shalt surely die. Now I, Abraham, saw that it was after the Lord's time, which was after the time of Kolob; for as yet the Gods had not appointed unto Adam his reckoning. 19 And they were both naked, the man and his wife, and were not ashamed. 20 And out of the ground the Gods formed every beast of the field, and every fowl of the air, and brought them unto Adam to see what he would call them; and whatsoever Adam called every living creature, that should be the name thereof. 21 And Adam gave names to all cattle, to the fowl of the air, to every beast of the field; and for Adam, there was found an help meet for him. Abraham fastened upon an altar. The altar for sacrifice by the idolatrous priests, standing before the gods of Elkenah, Libnah, Mahmackrah, Korash, and Pharaoh. The idolatrous god of Elkenah. The idolatrous god of Mahmackrah. Raukeeyang, signifying expanse, or the firmament over our heads; but in this case, in relation to this subject, the Egyptians meant it to signify Shaumau, to be high, or the heavens, answering to the Hebrew word, Shaumahyeem. 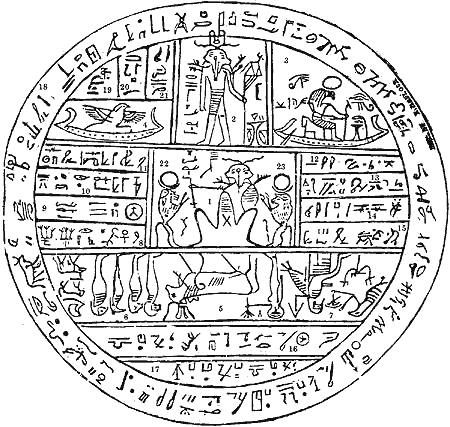 Stands next to Kolob, called by the Egyptians Oliblish, which is the next grand governing creation near to the celestial or the place where God resides; holding the key of power also, pertaining to other planets; as revealed from God to Abraham, as he offered sacrifice upon an altar, which he had built unto the Lord. Is made to represent God, sitting upon his throne, clothed with power and authority; with a crown of eternal light upon his head; representing also the grand Key-words of the Holy Priesthood, as revealed to Adam in the Garden of Eden, as also to Seth, Noah, Melchizedek, Abraham, and all to whom the Priesthood was revealed. Answers to the Hebrew word Raukeeyang, signifying expanse, or the firmament of the heavens; also a numerical figure, in Egyptian signifying one thousand; answering to the measuring of the time of Oliblish, which is equal with Kolob in its revolution and in its measuring of time. Represents this earth in its four quarters. Represents God sitting upon his throne, revealing through the heavens the grand Key-words of the Priesthood; as, also, the sign of the Holy Ghost unto Abraham, in the form of a dove. Contains writings that cannot be revealed unto the world; but is to be had in the Holy Temple of God. Ought not to be revealed at the present time. Also. If the world can find out these numbers, so let it be. Amen. Abraham sitting upon Pharaoh’s throne, by the politeness of the king, with a crown upon his head, representing the Priesthood, as emblematical of the grand Presidency in Heaven; with the scepter of justice and judgment in his hand. King Pharaoh, whose name is given in the characters above his head. Signifies Abraham in Egypt as given also in Figure 10 of Facsimile No. 1. Prince of Pharaoh, King of Egypt, as written above the hand. Shulem, one of the king’s principal waiters, as represented by the characters above his hand. Abraham is reasoning upon the principles of Astronomy, in the king’s court.